Repairs damaged hair from the moment you shampoo.The last 15cm of your hair is the oldest and most damaged. That is why fragile hair ends need dedicated care. Repairing and strengthening the last 15cm of hair is the key to having beautiful, healthy hair. New Improved Essential Damage Care repairs damaged hair from the moment you shampoo, all the way to the last 15cm! Deep-repair natural ingredients nourishes from the core to the surface, maintaining healthy hair. Ultra Shine Essence restores smoothness and radiance. For hair damaged by dyeing, perm and hair dryer. For hair losing elasticity and vitality. Hydrating Wild Rose Essence forms a protective film, leaving hair smooth. Shampoo:Apply to dampened hair and scalp. Massage gently. Rinse thoroughly. 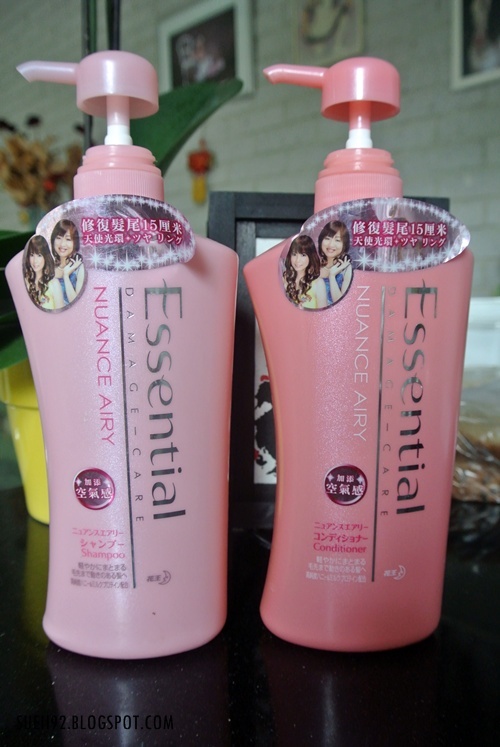 Follow with Essential NUANCE AIRY Conditioner for optimal result. Conditioner: Apply to shampooed hair. Massage gently. Rinse thoroughly. Use with Essential NUANCE AIRY Shampoo for optimal result. Honestly I don't really like these two products.Yes, it does maintain my healthy hair and leaving my hair smooth and shiny. Actually it has everything what I want, and the smell is very very nice. The very big downside is that it makes my hair weaker. In terms of losing more hair when I wash or blow dry my hair, and it makes my hair kind of flat instead of a bouncy airy looking. I saw a lot of good reviews about the Essential Damage Care line, even the big blogger XiaXue advertised this. But I think it's mainly for really damaged or dyed hair. Because this doesn't really work out for my fine hair. It makes my hair even weaker, like I just said. So no likey for these two. But if you have really damaged hair, this may work out for you.